Are you a crafty person (someone who likes to do crafts)? Do you want to learn more about your craft(s) or learn a completely new craft? 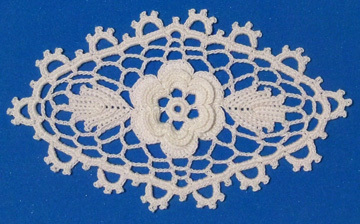 I love learning more about crochet, knitting and tatting, as well as lots of other crafts. In the past, I’ve done counted cross-stitch, needlepoint, embroidery, quilting, paper crafts, macramé and paper quilling, which are all lots of fun! I’m happy to announce that Annie’s is holding a big craft event this fall called “Annie’s Craft Festival” in Fort Wayne, IN from Oct. 30-Nov. 1. There will be classes taught there in beading, cake decorating, crochet, cross-stitch & embroidery, floral arranging, knitting, painting, paper & card, quilting and sewing. If you live in Indiana, anywhere near Indiana or love to travel, this is a great opportunity to learn more about your chosen craft(s) or to learn some new ones! Learn the fascinating technique of intermeshing (or woven crochet). Intermeshing produces a reversible fabric with two different looking sides. During this class you will learn to intertwine two different colored layers of crochet mesh while making 3 different swatch designs. This technique can be used to create almost anything you can imagine. Come and let your imagination run wild! Do you love the look of Irish Crochet, but are intimidated by it? Don’t be! In this introductory class, you’ll learn to make the basic Irish Crochet rose and leaf motifs. You’ll also learn to make a background for joining your Irish Crochet motifs together into a project. 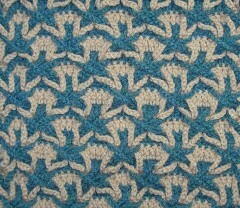 To finish it off, you’ll work a simple Irish Crochet edging around the edges of your assembled project. Irish Crochet is typically worked with cotton crochet thread, but if you’re not comfortable using crochet thread and steel crochet hooks, cotton yarn can be used instead. Come and learn this beautiful crochet technique! Polish Stars may look hard to make, but they’re really quite easy once you know the secret. No special skills are needed, just an eagerness to learn a new technique. Learn to work the basic stitch pattern in several different ways and weave the chain loops to see the “stars” take shape before your very eyes! It’s “almost” magic! 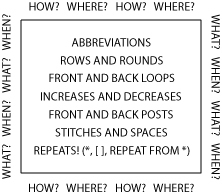 Do you keep making the same crochet item because you don’t know how to read a crochet pattern? Do you long to be able to read a crochet pattern, but don’t know where to start? In this class, you’ll learn the “rules” for reading a crochet pattern accurately, plus some extra tips on making your crochet work even better! Bring your crochet pattern questions to be answered by Susan Lowman, a crochet designer and technical editor with years of experience deciphering crochet patterns. After learning to read a pattern, start crocheting that project you’ve been dying to make in class! If you know how to work in rows, but working in rounds scares you, then this is the class for you! You’ll learn many different ways to start a round, when to turn or not to turn, where to place your stitches, and more. Leave your fear behind! Come and learn to crochet in the round so you can tackle that amazing pattern worked in rounds that you’ve been yearning to make! Have you seen it? It’s 3-dimensional! Wiggly Crochet is all the rage now in crochet. From hot pads and coasters to plush rugs, this crochet technique will be a wonderful addition to your crochet repertoire. 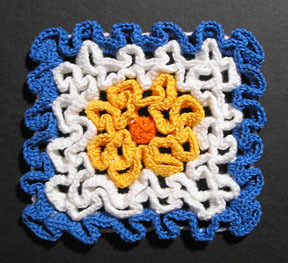 Learn the basics of Wiggly Crochet while making a flower coaster in this class. You’ll soon be addicted and won’t want to stop! Susan Lowman has dozens of published wiggly crochet patterns, including leaflets called “Hot Stuff for the Holidays”, “Wiggly Crochet Rugs” and “Wiggly Crochet Dishcloths”. Come and learn this fantastic crochet technique. There are some other events going on at the Annie’s Craft Festival, too, like a gala dinner with keynote speaker, Debbie Macomber, a Halloween party and a marketplace to purchase craft supplies! I hope you’ll consider attending this event. You can check out all the classes, read about the special events and register early for the best prices on their website here. I’d love to see/meet you there! 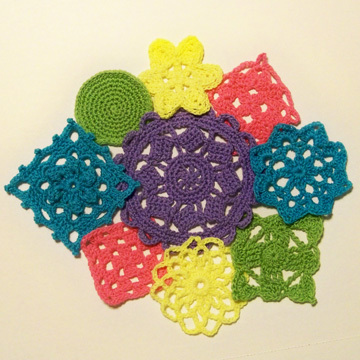 This entry was posted in teaching crochet and tagged crochet class, teaching. Bookmark the permalink.